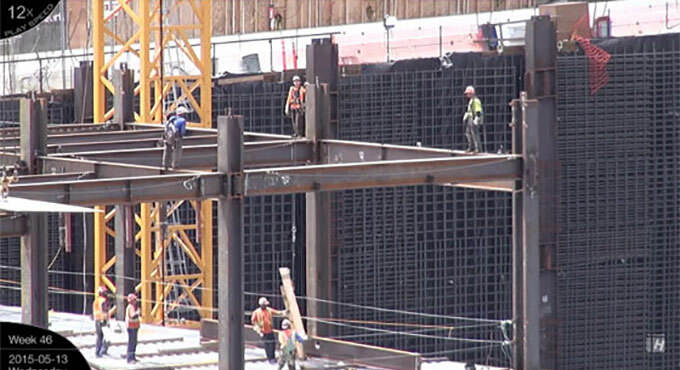 The following construction video focuses on the shots of general construction work of a new 12-storied hospital that will take up whole city block in San Francisco. The video mainly highlights construction time-lapse at 900x, with 54 "bonus" highlights/closeups scattered during a range of speeds, compacting the 5-day period from May 11 - 15, 2015 (Week 46) into about 40 minutes. Watch how the process is going on for assembling the frame of the building as well as using tower cranes. Work commences with the entry to the underground pedestrian tunnel.